Ospreys outside-half Dan Biggar says his side are sorry for playing badly in the 17-15 victory over Scarlets that sent them back to the top of the Pro12. The home side led 17-9 at half-time thanks to tries from Aisea Natoga and Dan Lydiate but failed to score any points in the second period. 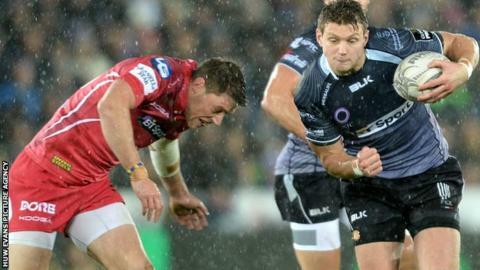 Scarlets closed the gap to set up a nervy end and leave Biggar frustrated. "It's an apology from us, we haven't played that badly for a while," he said. "We allowed the Scarlets to come at us, and we were lucky to get out of jail there. "We played well in the first - in fact we played some good stuff - but we were off the pace after that." Kristian Phillips received a yellow card for his tackle on Ospreys full-back Dan Evans. Ospreys backs coach Gruff Rees was pleased to see his side leapfrog Glasgow at the top of the Pro12, but shared Biggar's sentiments about their performance at the Liberty Stadium. "Ugly would be a pretty kind word really, we're disappointed in that as a victory," Rees said. "You've got to appreciate the four points in a local derby, but it feels a little bit of a hollow victory. "We were a mixed bag to say the least in the second half. We didn't capitalise and we were too rigid in what we were doing. "A couple of real dull penalties we gave away created tension we didn't really need, but we were the architects of that tension." Rees added that Ospreys' rivals would be feeling more optimistic before they meet at Parc y Scarlets on Saturday, 3 January. "They've come here and had a real good go," Rees said. "They tried to disrupt our game around the ruck area and they certainly did that. "They'll have players coming back and they can take great heart from that. "We've got a lot to go in terms of the potential of the team and we didn't show that today. "You have got to grind out wins and to our credit we did manage to do that, certainly in the last five, albeit it shouldn't have been that tight."